Mangaluru, Sep 5,2017: The end of SW monsoon, no doubt, has brought joy, but with rains abating the motorists are facing a other problems. Many of the arterial roads, including the national highway, are in a worn condition slowing down the traffic considerably. 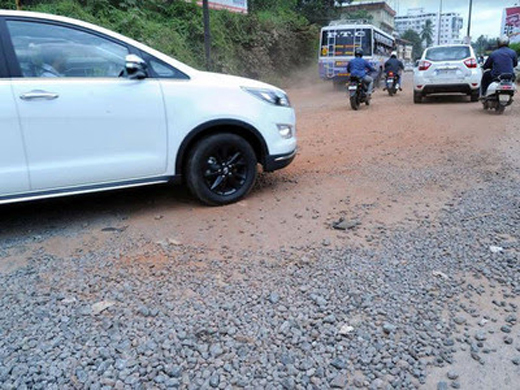 The national highway, especially the 37-km port connectivity road from Nanthoor to BC Road, has suffered the most damage. The problem starts from the Nathoor Circle itself with the left side exit onto Moodbidri- Sholapur NH 169 in a deplorable condition. Here the traffic gridlock is high since trucks, especially the multi-axle trucks, going to Bengaluru find it difficult to negotiate the curve and slow down the traffic considerably. Adding to the woes is a kind soul’s largesse in dumping mud during rains in the potholes at the spot, is now creating dust problems. There is another major gridlock point at Padil overbridge on NH 75, where the NHAI is carrying out the widening work and is stuck due to railways expansion project, where railways would be using concrete box to expand that section. The project was started about two years ago and motorists are having a tough time to travel on this treacherous road as it is shorn of asphalt at many places, presenting a uneven and jarring ride. The heavy rains that lashed the city a fortnight back have left the road in a frightful state, with deep potholes. After these two points, the next slow down comes near Melkaru near Narahari Parvatha, where the road has been damaged. Even a stretch after Kalladka is damaged. Near Dasarakodi a hump is designed unscientifically. A regular commuter to the city in a bus, says the Padil stretch is a nightmare, especially during rains. "During monsoon, the jams could last for 30-45 minutes. But, now they have reduced since rains have abated, but still the road gets blocked when one or two errant motorists, mostly bus drivers, try to overtake,’’ he says. NHAI project director S Vijay Kumar admitted that some stretches of Mangaluru-Bengaluru NH 75 were in a bad condition. "Now that the rain has stopped we will start the patch-works,’’ he added. Regarding the Padil section, Vijay Kumar said the slab (by railways) is being cast and the section will be made good within a month. Not only the highway but all the roads in the city are in poor condition. We have to blame the MCC. It is not due to rains , but not a single official is concerned just bothered about his own benefit .